This blog is about how Care Inspectors in Sweden are using Talking Mats. On 18th March I met up with old friends – Ulrika Ferm and Eva Holmqvist – at the ISAAC Denmark Conference in the beautiful Vingsted Conference Centre in West Denmark. 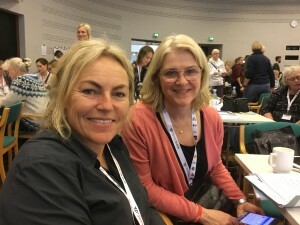 Ulrika and Eva work at DART Communication Centre in Gothenburg Sweden http://www.dart-gbg.org/english/. I was giving a presentation on new developments in Talking Mats and as always happens when we meet, we talked non stop about families and work. Ulrika told me about the following initiative in Sweden and we agreed it would be useful to write a blog about it. 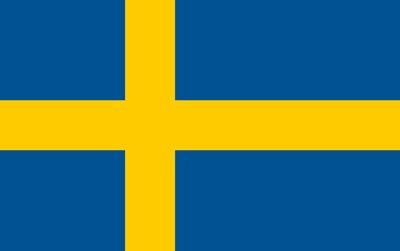 The Health and Social Care Inspectorate https://www.ivo.se/ (the Swedish equivalent of the Care Commission) had been in touch with DART about how they could get the views of people with dementia who live in care homes. DART made a program of communication for the inspectors which included a first day about communication and dementia. Following this there was a full 2 day course on Talking Mats for 15 inspectors who then went on to pilot the use of Talking Mats as a way to get the genuine views of residents. It was so successful that they are planning to roll this out elsewhere. Now more inspectors in Sweden are getting Talking Mats training and using pictorial support as preparations before inspections. It would be really good if this could happen in Scotland. This entry was posted in Blog, Care Inspectors, Dementia, Personalisation and tagged Dementia, Personalisation, standards on March 22, 2019 by Joan Murphy. In September 2016 Aideen Lawlor (SLT Manager) and I (Senior SLT) won the Dementia Elevator award with a project entitled “Empowering Persons with Dementia to become more Active Participants in Decision Making Related to Their Present and Future Needs.” with Talking Mats being an integral part of this project. In November 2017, the prize money was used to fund my training to become an accredited Talking Mats trainer so that I could then train others in TM Foundation Course on a prioritised basis. This project is now complete with 6 speech and language therapists (SLTs) from a variety of settings working with persons with dementia all trained in using Talking Mats. As part of their training, The SLTs used TM with patients/ residents with particular reference to the Assisted Decision Making (Capacity) Act 2015. TMs were also used to help the clinicians to get to know their patients, in care planning, in improving increased opportunities for interaction and in improving choices and decision making. In effect, we were checking it out! That the pictures help maintain attention and aid comprehension. That it facilitated strengths rather than a deficit model. That photographed completed TM provided a pictorial record for meetings – very positive. That it provided a significant catalyst for change in some instances. The next phase is to expand the number of SLTs who can provide training in Talking Mats across the Republic of Ireland. Funding from the national SLT professional body training grant scheme has been sought for these 6 SLTs to become trainers for Talking Mats. This will result in cascading training on a priority basis, increase evidence base/ knowledge re using TM and embedding TM in variety of clinical settings with SLTs leading this practice. Once you have accessed Foundation Training you can apply for our Accredited Trainers course to enable you to deliver Talking Mats training to others in your area. This entry was posted in Blog, Communication difficulties, Dementia, Eating and drinking, hospice, ICF, Impact evaluation, Participation, person centred approach, Personalisation, Self directed care, Self management, Talking Mats principles, Training and tagged Communication difficulties, Dementia, Eating and Drinking, goal setting, Hospice, Learning Disability, Participation, person centred, Personalisation, self-management, Talking Mats, Training on March 7, 2019 by Lois Cameron. Talking Mats received funding from The Health and Social Care Alliance Scotland to look at how using the Digital Talking Mats can help people with long term conditions, including dementia, to manage their health and well-being and to recognise their own strengths and abilities. We also hoped that participants would be able to have more control over their lives and have improved communication with families and professionals. 11 people living with dementia and their partners were involved in the project. 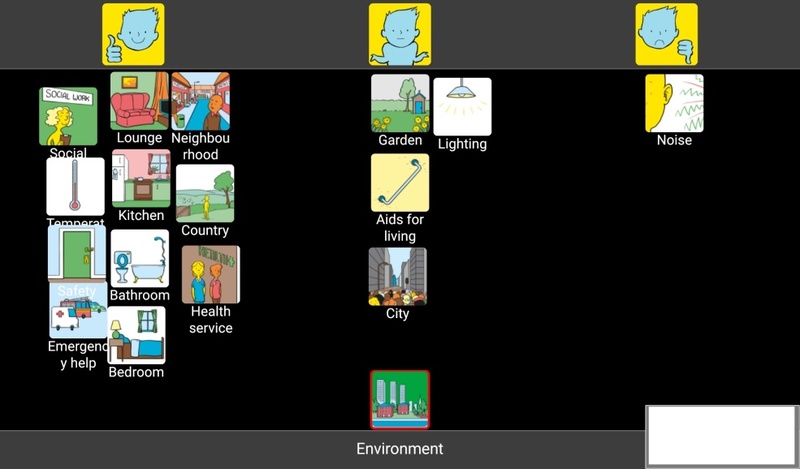 Each participant had a tablet device and was given a personal digital Talking Mats licence which gave them access to 13 topics in the Talking Mats Health and Well-being resource. We visited each participant at home, taught them how to use it and asked them to complete at least 1 digital Talking Mat per week for 6 weeks on any topic they wished. The design of the digital Talking Mat allowed them to email their mats directly to us. We visited each participant a second time to discuss how easy it was to use the digital Talking Mats and their views on their completed mats. We asked those who wished to, to continue sending us completed mats beyond the initial 6 weeks and we visited them again in 6 months to discuss how they were managing. 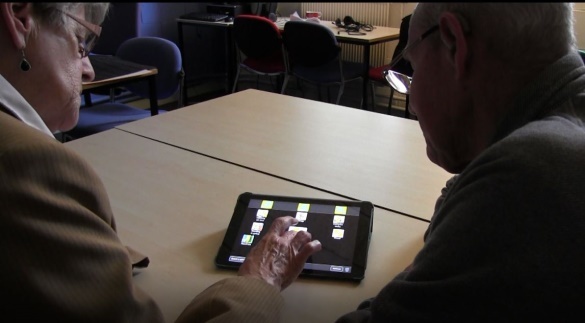 In total we received 94 digital mats across all 13 topics from the participants living with dementia who reported that the use of the Digital Talking Mats during this project gave them a better understanding of their own individual health and social care needs. 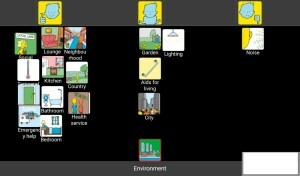 As well as helping participants self-manage their lives, an unexpected outcome of this project was that many people found that using the Digital Talking Mats helped them see the positive things in their life and not just the negative. It also highlighted that despite having a deteriorating illness, things were not getting worse. The following are some of the comments we received throughout the project. ‘It made me realise things are not so bad’. 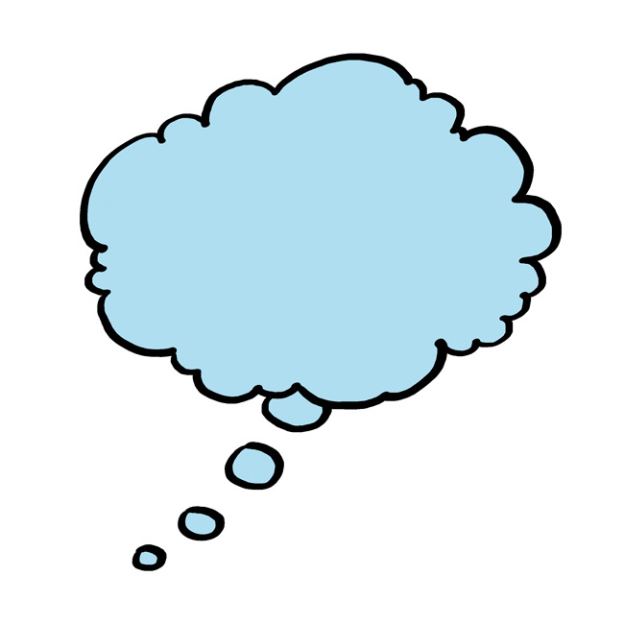 This entry was posted in App, Blog, Dementia, Digital Talking Mats, Personalisation, Research and tagged Dementia, Participation, Research, Talking Mats on September 4, 2018 by Joan Murphy. Connecting People, Connecting Support is a new policy document in Scotland and shares how allied health professionals (AHPs) in Scotland can support people with dementia, their families and carers to live positive, fulfilling and independent lives for as long as possible. The policy document presents an evidence-informed case to support a biopsychosocial approach to practice for ALL AHPs in Scotland when working with people living with dementia – what we call the AHP approach. 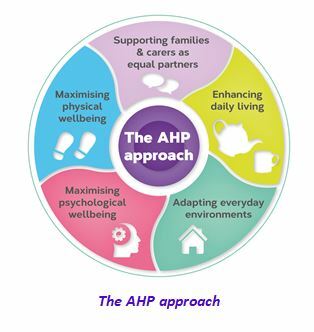 The fundamental understanding driving the AHP approach is that people living with dementia CAN benefit from AHP-led interventions. In this week’s blog we are sharing the AHP contribution to maximising psychological wellbeing. What do we mean by psychological wellbeing? The central importance of finding ways to communicate (verbal and non-verbal) that work for each individual and which make meaningful connections that may have wide-ranging benefits in relation to overall wellbeing and quality of life is recognised. Psychological interventions of different intensities are reflected to promote emotional health and psychological wellbeing, with the provision of psychological interventions for depression, anxiety, and expressions of stress and distress. This element builds on established AHP psychological interventions and therapies. Why is psychological wellbeing important? People with most types of dementia will at times struggle to find the right words or follow a conversation. Dementia can have a profound psychological impact and may be linked to feelings of anxiety and depression. A non-pharmacological therapeutic approach is advocated for the treatment of psychological symptoms and a person-centred stepped-care model of support. 3 ways allied health professionals CAN maximise psychological wellbeing? AHPs are aware that optimum communication occurs in environments that are comfortable, where a person can feel relaxed and safe, and when the AHP-led intervention is tailored and individualised. AHPs have experience in training others in conversation skills and cuing strategies, identifying key elements for effective everyday communication and supporting opportunities to practice communication strategies in a social context, helping the person to gain confidence in the interaction. Speech and language therapists can provide personalised communication advice (aimed at, for example, developing communication passports, assessing communication networks and maximising communication opportunities) that is shared with family members to facilitate their communication skills. 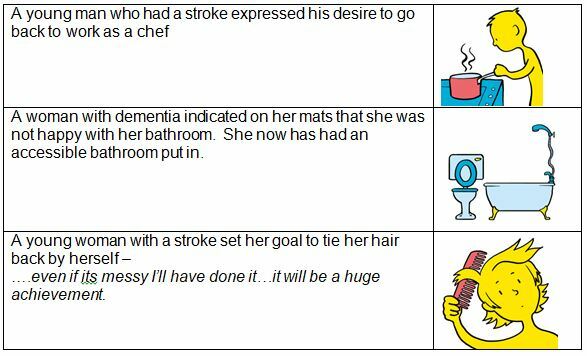 Where language difficulties present as a primary feature of the dementia, as in primary progressive aphasia, speech and language therapists will carry out assessments to identify specific communication impairments and abilities. Their findings will contribute to the diagnosis and be used to plan therapy and strategies. AHP core psychological skills are unique to each profession and vary according to their undergraduate education and postgraduate development activity. AHP interventions to maximise psychological wellbeing require excellent communication skills and the ability to integrate psychological interventions and psychological therapies into core AHP practice. A number of approaches based on the psychological understanding of dementia and its effects, including reminiscence approaches, life-story work, anxiety management, and engaging in everyday occupations and activities, will be core to AHPs’ day-to-day practice. With additional enhanced training opportunities, psychological interventions can also become core to AHP roles and integral to a team approach to a stepped-care model of assessment and intervention. Psychological interventions include motivational interviewing, behavioural activation, mindfulness based cognitive therapy, cognitive stimulation therapy, cognitive rehabilitation and cognitive behavioural therapy. Specific psychological interventions providing individualised, formulation-led interventions in response to stress and distress in dementia, ranging from low-intensity to specialist interventions, can also be within AHP remits. Psychological therapies are highly specialised psychological interventions that include the established AHP disciplines of art psychotherapy and music therapy. Art psychotherapy creates opportunities for verbal and non-verbal communication by using art to enable people to feel connected to a sense of self, other people and the environment around them. It can support people living with dementia by reducing anxiety and increasing coping skills (Safer & Press, 2011), depending on how interested the person is in art activities, art materials and how they feel about one-to-one or group activities. Art psychotherapy can be particularly helpful for people who find it hard to express their thoughts and feelings verbally, enabling self-expression and enhancing sense of self and personhood. Music therapy builds on people’s ability to respond to music to develop a therapeutic relationship and facilitate positive changes in emotional wellbeing and communication through engagement in live musical interactions. It has a robust evidence base as an effective, non-pharmacological intervention that can significantly improve and support the mood, alertness and engagement of people with dementia, reduce the use of medication, and help to manage and reduce agitation, isolation, depression and anxiety (Ridder et al., 2013). These art-based therapies are particularly helpful when people find their emotions are too confusing to express verbally, when verbal communication is difficult or when words are not enough. Supervision for the AHP professions is integral to all of the interventions. As an AHP, how do you currently support people living with dementia to maximise the persons psychological wellbeing? As person living with dementia, what support would you like to receive from allied health professionals to maximise your psychological wellbeing? As family carer, what support would you like to receive from allied health professionals to maximise your psychological wellbeing? This entry was posted in Blog, Dementia and tagged Dementia on May 4, 2018 by Joan Murphy.